If you are looking to build a fireplace it is often broken into four factors; hearth, surround, insert and stove or fire. Depending upon if you plan to have a hearth mounted fire or inset stove you will require a back panel with a fixed opening in it to accept your fire. If you would like a freestanding stove or firebasket you will need a chamber and slip set. Alternatively you might consider a traditional cast-iron fireplace insert. If you plan to purchase a separate surround then you will need a fireplace insert, if not then you will need a fireplace combination. What is the difference between a fireplace combination and a fireplace insert? Fireplace combinations are complete with shelf and finished edges, requiring no additional surround. This distinguishes them from fireplace inserts, which need backing panels and surrounds to complete the piece. Therefore combinations save you the hassle of mixing, matching and installing. Fireplace combinations also tend to be smaller than other fireplaces and are ideally suited for smaller rooms and bedrooms. Our cast iron fireplace combinations have been faithfully reproduced from original Georgian, Victorian and Art Deco pieces to achieve an authentic design. The function of back panels and slips are to place distance between the inside edge of the fireplace surround and the outer edge of the fire-chamber opening, without leaving an unsightly gap or negative space. 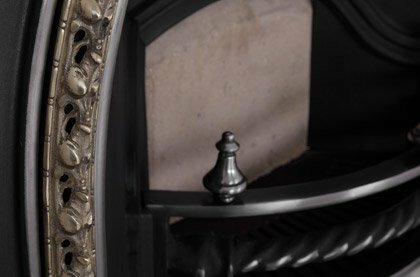 Available as part of our mix-and-match selection, here you can choose from a range of cast-iron inserts and fascia's to suit your taste and home and create your very own custom fireplace. If you would like a freestanding stove or firebasket you will need a chamber and slip set. 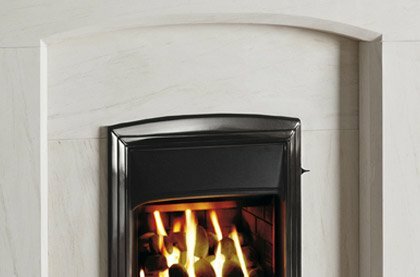 If you have an existing chimney breast and are thinking of opening it up and placing either a freestanding stove or open firebasket into it, then you will most likely need to line your opening with either a pre-made chamber set or chamber lining panels. Our selection of chambers and lining sets are great additions to your fireplace and can be used on their own with a hearth and fireplace beam, or in conjunction with a brand new fireplace package. 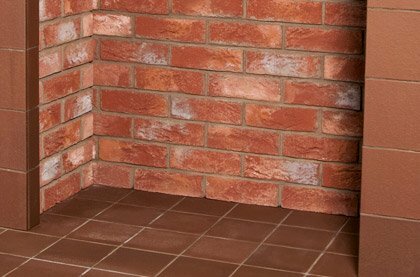 Choose from vermiculite boards, mica brick effect panels, natural stone or cast-iron panels.